Like most of its neighboring states, Wisconsin does not have enough naturally occurring gold to interest commercial gold mining endeavors. However, gold is often recovered as a byproduct from copper and iron mines. 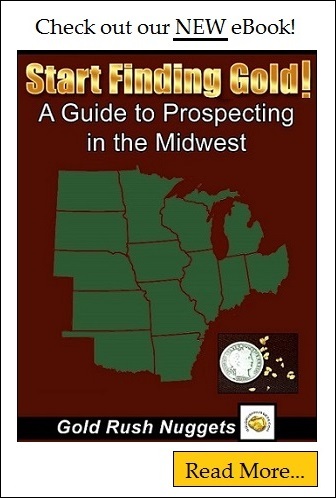 If targeting for gold specifically, small placer deposits can be found throughout the state, and many part-time gold prospectors are successfully finding gold in the rivers and streams of Wisconsin. Gold occurrence in Wisconsin is a result of glaciers depositing gold bearing gravels from Canada thousands of years ago. As the glaciers moved south over top of present day Wisconsin, they carried with them some rich gravels from Alberta which had gold in them. The very natural of the glacial action wore down these gravels into very fine dust, which were left behind as the glaciers receded. Because of this, the vast majority of gold found in this state will be extremely fine so don’t expect to recover large nuggets. Gold is almost always found in the form of fine textured specks, commonly called “flour gold” due to the extreme fineness. Gold can be found in just about any waterway throughout the state, including along the beaches of Lake Superior. Search in the same areas that you normally would expect gold to accumulate; inside bends of streams and rivers, high-and-dry gravel bars, behind large boulders and other obstructions, and just about anywhere else that gold might be allowed to settle out. One other noteworthy area is Plum Creek in Pierce County, where several have reported good luck panning. In addition to the well known glacial deposits, many are surprised to hear that there is also a surprising amount of lode gold available in Wisconsin. Unfortunately, these are yet to be commercially viable, due to the high cost of extraction and relatively low grade ores. These lode areas do contribute to the small amounts of gold that can be found by in the waterways throughout the state. Recreational gold panning and small scale prospecting is currently allowed in Wisconsin without needing any permits. Always get permission if prospecting on private land, and take care to limit disturbances when digging. Using larger motorized equipment requires additional permitting, but simple tools like sluice boxes and gold pans do not. As most of the placer gold is scattered and not heavily concentrated in any key areas, there is limited interest beyond small scale recreational prospecting. A hard days work might yield a small amount of fine gold, but it is very unlikely that enough could be recovered to interest any commercial endeavors. In recent years there has been much interest in gold discoveries associated with iron ore deposits throughout the state, but the economic viability of mining these resources lies heavily on the value of producing other minerals including lead, zinc, copper, and silver, with gold as a by-product.